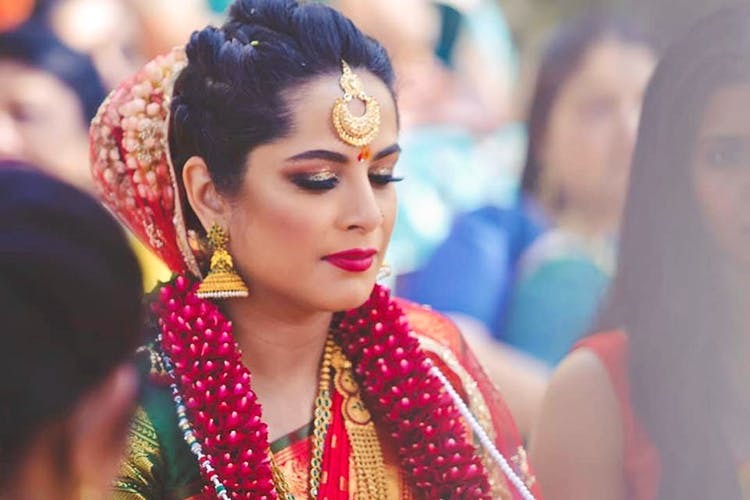 Adored by brides, Gloss N Glass – an Ulsoor-based makeup studio – gives you customised looks that’ll have you looking like a queen on your wedding day. With over ten years of experience (each) in their makeup kitty, Dipanwita Das Choudary and Geeta Rao, two professional makeup artists and pals, came together to launch Gloss N Glass. The duo have garnered experience prettying up runway models at Amazon India Couture Week, Dubai Fashion Week and have even dolled up actresses. But Gloss N Glass (which has branches in Ulsoor and Koramangala) is best known for being a bride’s go-to makeup studio in the city. And we recommend you sign them up for your special moment. Once your date is set in stone, give them a call as soon as possible. During the second half of the year, when weddings are in full flow, booking them might get a tad difficult so ensure you have them onboard at least two months in advance. You can choose between juniors artists (INR 15,000 per session) and senior and top artists (INR 25,000 and above per session). And then get down to customising your look for D Day. Gloss N Glass likes to keep things trendy and fresh. So, you can choose between neutral looks or HD makeup or even go for airbrushing and they’ll be happy to help. They also work with products from leading brands like MAC, Huda Beauty and Urban Decay. If you prefer to sign them on for the entire bridal party, they offer those services too. Apart from the studio, Gloss N Glass has established a makeup academy as well. They offer long-term and short-term courses in the art of makeup and you can give them a call to find what’s on offer. They also conduct short workshops (these can be customised for corporates or for a group of people) that impart wisdom on self-grooming or makeup looks for work. You can follow them on Facebook to know more.